You’ll often find her name mentioned in our “Catch Your Colleague Doing Something Great” section or sharing her brilliant Irish sayings. So it comes as no surprise that our very own Denise Trimble has been honored at the Irish Echo’s Golden Bridges Conference. 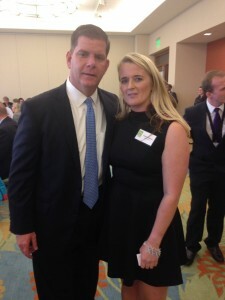 Check her out pictured above with Mayor Marty Walsh! Golden Bridges spotlights community, business, education, arts and culture initiatives in northwest Ireland and promotes partnerships with their peers in Boston and Massachusetts. Denise is among those being honored for forging transatlantic links that build our communities and countries.